So, I got along to the pub on Saturday to watch the Dragons v Warriors match. A hardly convincing opener against the Tigers but with the amount of points we managed to pile on in the first round, there was cause for cautious optimism compared to how we fared last year. It was a bit of a see-saw in the first half and as the match progressed I began to notice that, there was a guy sat on a nearby couch who had something to complain about in the way the match was being officiated on virtually every set of six: Warriors allegedly throwing forward passes, Warriors players being inside the 10, Warriors hands on the ball in the tackle, Dragons play-the-ball being slowed down. And every observation this guy made was coupled with an epithet directed towards Jared Maxwell. And we’re not talking simple remarks like “You’ve got to be kidding ref!” that we’re all guilty of yelling at the screen when we think our team’s copped a bad call, but remarks like “F*ck off, Maxwell!”; “Bullsh*t, Maxwell! You f*ckin’ cheat!”; “You stupid Sh*re prick, Maxwell!” (how did he even know Jared Maxwell was from the Sh*re?). Based on the way the guy was carrying on, you’d almost think Maxwell had channeled Steve Randell and molested the guy’s children or something! 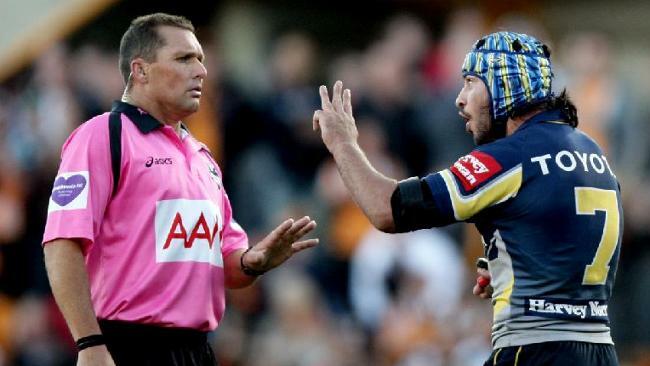 I know certain NRL referees have copped some serious stick over the years (I have to admit I always had it in for Steve Clark), but Jared Maxwell just struck me as a pretty neither-here-nor-there referee in the NRL. · The Dragons have won 16 of those matches and lost 11, giving them a win-loss percentage of 59.26%. · In the same 2006-2014 period, the Dragons overall record as been 110 wins, 1 draw and 95 losses, giving them a win-loss percentage of 53.64%. · What can we extrapolate from all this? The Dragons are statistically more likely to win a match when Jared Maxwell officiates them than when he’s not! I wonder what old mate down at the pub might have to say in relation to that? Numbers don’t lie. That is an email I got recently from my buddy Richard. It’s an odd story, but aside from the Maxwell specifics, I bet it reminds you of someone you know, if not yourself. It used to be me. For a large portion of my life, most of the sporting teams I supported were fairly ordinary. For my teams to win, we needed almost everything to go our way, including the referee’s decisions. So I would scrutinise every call that went against us, make hypotheticals for what would have happened if those decisions hadn’t gone against us and rationalise why we had lost and why we would have won if the referees hadn’t been so blind. I hated all sports officials. Then one day – completely out of the blue – I had the sudden realization that it didn’t matter. The referee wasn’t biased, he was just awful. They all are. The seemingly obvious theory is – The problem with being a sports fan is that a lot of the time all you want to see is when your team is slighted by the referee, but never when your team gets an advantage from the referee – Your passion for your team makes you blind to it. It is similar to the way a gambler remembers how much they have won in a particular night, but never how much they have spent to get there. The best way to test this theory? What was the last time that you watched a game where your team wasn’t playing and thought the referee was biased against one of the teams, rather than all the bad calls evening out over the course of the match? And the time before that? And before that? If you are being honest and you can actually remember three occasions, I’m (a) impressed and (b) certain you have gone back at least three seasons. So really/statistically, what are the chances that your team is robbed by these clowns every week? The list was endless. I have no doubt that every point he made was valid. But I’m also certain that he didn’t see or didn’t want to see the poor calls that went against the Tigers. The refereeing was terrible, but that wasn’t his complaint. 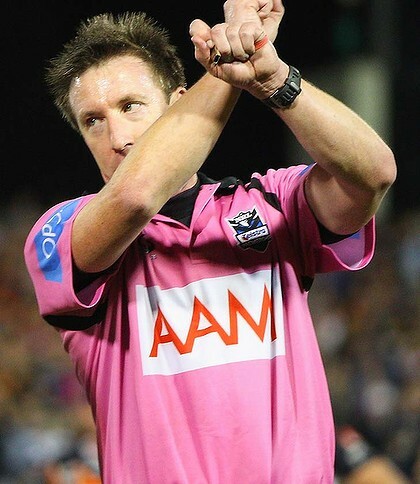 His complaint was that the refereeing was against Souths. In all honesty, I thought the Tigers did benefit from the refereeing a little more than Souths did, but the point is that the Bunnies weren’t good enough to win the match, regardless. They were awful. One of their worst performances in the last 2 years. They didn’t deserve to win. If South Sydney had performed better they would have won in spite of the refereeing. In my referee hating days, I used to wonder why the coach didn’t come out and complain about the blatant refereeing errors that I had seen, and I now realise that the reason is because all it does is give the players an excuse for losing. The aim is to be good enough that the refereeing decisions aren’t enough to stop you from taking the match. Now, this does not excuse the outrageously poor standard of refereeing that is in the NRL currently. Between two referees on the field, two touch judges and a video referee with adequate technology to review decisions, they get at least one decision blatantly wrong in every match. EVERY MATCH! Sometimes I wonder if I even know the rules any more while I am watching these games. Then I realise that is a very real possibility. The fault for that lies directly at the feet of the NRL themselves. For some reason, every off season the NRL seems to find the need to change at least 5 or 6 rules for the next season. Some of them are big rule changes, some of them are small. But in a game where there are already an inordinate amount of rules to officiate on, changing them every single off season gives the poor referees*** no hope! Last year there were 8 major rule changes in the off season and I have no idea how many minor ones. If the NRL wants to arrest the continuing slide of refereeing standards, they need to put a moratorium on rule changes for at least a year. Unless there is a dangerous issue in the game, there should be no rule reviews at the end of this season and at the most they should only happen every 2 years. To make matters worse, most of the rule changes that are brought in each year are a reaction to the tactics employed by teams the season before. The people that instigate these changes? The NRL coaches. Instead of having to out think the opposing coach, they can now go into the offseason with a plan to change the rules to stifle the ladder leaders. Then the changes that are made create new tactics that in turn generate more rule changes. I guarantee that if the rules were reviewed and changed only every 3 or 4 seasons we would see coaches find tactical ways to counter act their opposition’s strengths, and half of the rule changes that are made would be unnecessary. For the sake of both the fans and the officials, we need to stop with the changes. Since having my epiphany about the referees I have found watching sport immensely more enjoyable. Mostly because half of the teams I support are still pretty awful, and taking the referee out of the equation makes it so much easier for me to accept a loss. Most of the time, my team simply didn’t deserve to win. I am able to analyse the team’s performance in a much clearer way. I can see the weaknesses in game plans and players^ and can accurately assess if the team is improving week to week. I implore everyone else to try and do the same when watching your teams this year. When you lose, look at what the team could have done better, not what could have gone right for them. Stop complaining about the referees. They are terrible, but they are not against you. After all, when was the last time you felt like you had an intelligent conversation with someone about sport where they tried to convince you a referee was against them? ** With all the furore over head contact I’m amazed that this one has gotten almost no attention. Noel Kelly would have been proud and that guy got sent off twice in one game! ^Possibly South Sydney’s greatest weakness right now is having 3 Burgess brothers as walk up starters in the team, and nobody is willing to admit it, but that is a point for another time. I’ve gone down a similar path (probably a Souths thing). I now take the view that your team has to be good enough on the day to ensure dodgy decisions don’t cost them the match. On the watching 2 teams you don’t support point, at times I’ve suspected there’s an unconscious bias that creeps into refs heads when say Melbourne are down by 12 against Parramatta 15-20 minutes in to game. Could be a rooting for the underdog thing though.